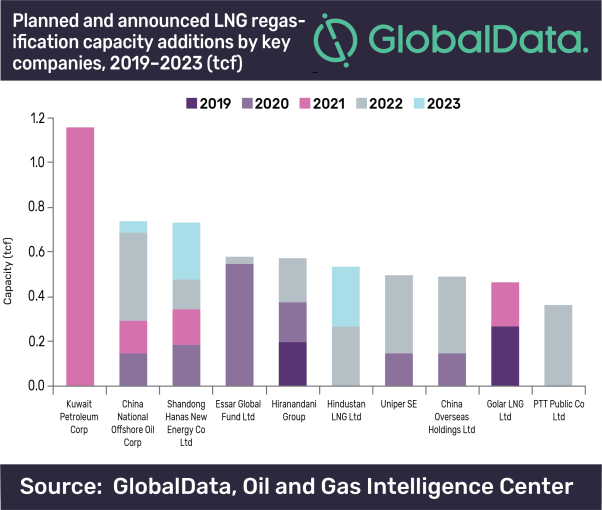 Global liquefied natural gas (LNG) regasification capacity is expected to grow by 43% between 2019 and 2023, from 45.7 trillion cubic feet (tcf) in 2019 to 65.9 tcf by 2023, according to GlobalData, a leading data and analytics company. The company’s report: ‘H1 2019 Global Capacity and Capital Expenditure Outlook for LNG Regasification Terminals – Kuwait Petroleum Leads Global Regasification Capacity Additions’ reveals that Kuwait Petroleum Corp is expected to lead the global oil and gas companies with the highest new-build LNG regasification capacity additions of 1.2 tcf by 2023. In terms of new-build capital expenditure (capex), China National Offshore Oil Corporation has the highest new-build capex of US$4.7bn to be spent on new-build regasification projects in the outlook period. Shandong Hanas New Energy Co Ltd and Kuwait Petroleum Corp follow with US$2.9bn and US$2.7bn, respectively. Among regions, Asia is expected to add the highest regasification capacity of 12.6 tcf by 2023. Within the region, India plans to add the highest capacity of around 4.3 tcf by 2023. In terms of new-build capex, India stands third with US$4.9bn over the next four years. GlobalData identifies Europe as the second highest among the regions in terms of LNG regasification capacity additions. 11 countries in the region are expected to add 2.4 tcf of planned capacity by 2023. Within the region, Germany, Croatia and Ireland are expected to be the major contributors with capacity additions of 0.52 tcf, 0.30 tcf and 0.29 tcf, respectively. The region plans to spend around US$6bn on the upcoming terminals, between 2019 and 2023. The Middle East is the third highest region in terms of regasification capacity additions. The region is expected to add roughly 2.4 tcf by 2023. Within the region, Kuwait has the highest planned capacity of approximately 1.2 tcf by 2023. Capex to be spent by Kuwait during the forecast period is US$2.7bn.